I am sitting in my tent, watching the beads of rain roll off the plastic windows, and drinking a gluten-free beer–my first in two years. Another first happened for me last night–I slept in a tent in the backyard with the kids. It’s funny, the things you do when you’ve suddenly become a single parent. I also signed up for another marathon. 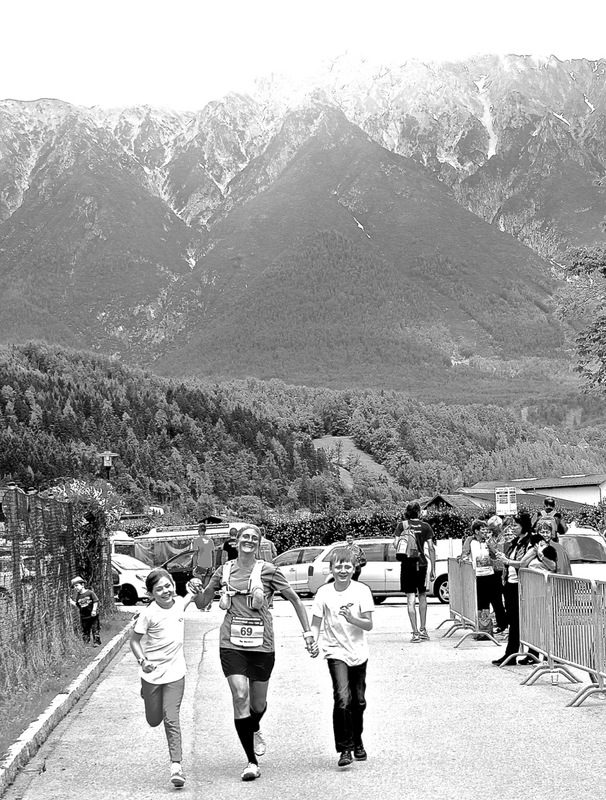 This is not the Jungfrau (in September) but the Pitztal Gletscher marathon–the same one I did last year. Many factors went into this decision. 1) I wanted to take the kids camping. 2) There is a campground by the finish line. 3) It’s Tirol–one of my favorite places in the world. 4) It’s a marathon ‘from the glacier to the city,’ which means both mountains and descent. The marathon is about 3 weeks away, and I’ve been doing nothing but CrossFit training. Thus, this weekend I thought it might be good to actually go for a long run. “Twelve miles?” my coach asked. “I was thinking 18,” I replied. Right, I thought. I’ll do 18. Some people say running is boring, and I can see how they might think that. It’s just you–alone with your thoughts. So what do I think about when I run? Do all German couples color coordinate? I see the ice cream stand! I hope they have coconut. In fact, the list DOES go on. Usually, my 3 hour runs are a non-stop, stream-of-consciousness narrative containing everything from deep philosophical issues to utter randomness. On this particular run, I literally zoned out for about forty-five minutes. When I ‘woke up,’ I couldn’t remember which part of the trail I was on. I was curious how this run would go, since I haven’t actually been running consistently in months, though I have been CrossFit training five days a week. Overall, I felt really strong during the run. My endurance was great, and I felt like I wasn’t even breaking a sweat. The only problem was that my calves started cramping at mile 15, so I stopped, sat on the lakeshore and watched the sailboats, while I stretched and ate the last of my apple slices. After that, I walked for about a kilometer. It felt like ages. In the end, I finished strong, and clocked in at just over three hours, which was pretty good for me, considering the stops. I did not get ice cream. I wasn’t hungry anymore. But I did feel good. Good that I had made it. Good that I had stopped to enjoy the setting. Good that I could purge a few issues from my over-worked brain. Running isn’t a hobby. Like CrossFit, it’s part of the landscape that defines my life. It makes me feel more like the real me. My kids understand this, which is why they push me out the door when I get those guilty feelings. I’m not a great runner. And you won’t see me in a CrossFit Throwdown any time soon. But these are part of my life, as much as writing or reading or parenting or breathing. This is my real life. Now, it’s dark. The birds stopped singing. My glass of beer is empty, and it’s time to zip up the sleeping bag and rest. I’ve got to run in the morning. This entry was posted on Tuesday, June 17th, 2014 at 9:12 pm	and tagged with Crossfit, exercise, healthy-living, marathon training, Pitztal Gletscher, Running and posted in Crossfit, Health, Life, Marathons. You can follow any responses to this entry through the RSS 2.0 feed. That is a wonderful way to sort out how you really feel about a subject, examine it from all angles while running. No phones or TV or computers to get in the way. Great writing , Keri. We love you!